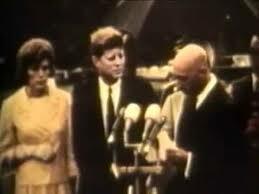 With Jackie still away from Washington recuperating from the death of her infant son Patrick, JFK and sister Eunice hosted a state dinner for King Mohammed Zahir Shah and Queen Homaira. The dinner, originally planned for the Rose Garden, was moved inside by Jackie, who was directing the event from afar because of rain. Earlier in the day, when Jack and Eunice had greeted the arriving dignitaries, they refused to wear raincoats or use umbrellas, causing them and the guests to get thoroughly drenched, except for the Queen who had shielded by a military attendant with an umbrella. The evening’s entertainment included a performance of the Marine drill team and fireworks. The Jefferson Memorial was lit at night for this special occasion and could be seen by the guests in the blue room and South Portico.